Kolaghat unit, which commenced production in February 2010, has adopted the latest technology with sophisticated control equipment to ensure consistent quality of cement. The Plant is located in Kolaghat in the district of Purba Medinapur and is in close proximity to the customers of West Bengal, Assam and Orissa. The facility is well connected by road through NH-41 and NH-6 and by rail through the main Howrah- Kharagpur broad gauge line. is manufactured here and the installed capacity of the Plant is about 0.95 MTPA. 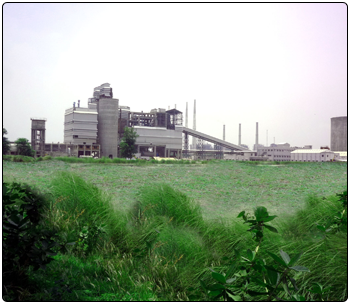 Clinker is being ground with gypsum & flyash into a fine powder for the manufacture of cement. All measures are adopted to ensure a certain specific surface with the required particle size distribution. Closed Circuit mill along with latest high efficiency separators ensures proper particle size distribution of cement. The mill ventilation air carries a small portion of the fine material, which is dedusted in Bag filter. This is critical from the perspective of protecting the environment. Cement is stored in two cement silos, extracted, bagged by two electronic rotary packers of capacity 240 TPH each consisting of 16 spouts with an accuracy of +50 gm and -0 gm, and shipped by trucks.